Talking about miscarriage with your partner, friends or family can be difficult. Here are some tips and ideas to help things go more smoothly. It might feel strange to plan a conversation but a bit of preparation can help you feel more in control. Writing things down may help you work out what to say. You could make some personal notes or write a letter. You might decide to let other people read it. This can be helpful if you have a lot to say or find it hard to open up. Choose a time when you are both able to talk without distractions. Some people find it easier to talk if they are side by side, for example sitting in the car or walking together. Other people prefer being at home or in their own room. It’s helpful to think about how they might react and how you will respond. This helps you feel more in control and can stop the conversation turning into an argument. You might find some other suggestions and ideas from people on our forum and in our Facebook group who have had similar experiences. I’ve got a problem and I’d like to talk to you about it. Can we chat now? Something has happened that I’m finding it hard to cope with on my own. Would it be ok to talk to you about it? I’d like to talk about how I’m coping after the miscarriage. Is now a good time or when would be a better one? 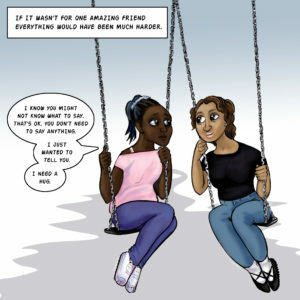 Sharing other people’s stories can help you explain how you feel. Have a look at our stories section. Try and use ‘I’ statements. Using ‘you’ statements can sometimes sound accusing, especially if you say things like ‘you always’ or ‘you never’. It can make people feel defensive. Instead of ‘you never seem to want to talk about it’ you could say ‘sometimes, I feel that we don’t talk about what happened as much as I’d like’. Even if you feel that they never DO want to talk about it, the second version helps involve them in solving the problem together. Listen to them too. One useful technique is the five-minute rule. One person gets five uninterrupted minutes to speak while the other listens. Then the other person gets five minutes to respond. Try to stay calm. If you find yourself feeling stressed take three long deep breaths, really expanding your chest and belly. Taking a breath can also help you work out what you want to say next. If things are getting too emotional or difficult, consider taking a break. You might find that talking about miscarriage has helped. Other people may have reacted in a better way than you expected. It may be that things are difficult for a while as your family, friends or partner make sense of what you have told them. Give them a bit of time. It might help to give them some of our leaflets to read. If there is something specific that you want help with, make sure you ask for it and try to leave the conversation with a plan. Unfortunately, some people might react badly or say things that are hurtful or upsetting. If this is the case, you might find it helpful to talk to us.